(Lanka e News - 29.March.2019, 11.30PM) The past decade has seen the largest number of people forcibly displaced as a result of conflict, violence, or persecution since the Second World War. With most recent numbers reaching 68.5 million, the global refugee crisis is indeed one of the most devastating events in recent history. UNHCR, the UN Refugee Agency, estimates that 5.2 million people were newly displaced in the first half of 2018 and that there are 20.2 million refugees and 3.2 million asylum seekers across the world as of 2018. Migrants, refugees and asylum seekers – are they one and the same? Often used interchangeably to refer to refugees, the terms migrant, refugee and asylum seeker each refer to specific situations in which people who are displaced find themselves. Conflating these meanings may undervalue a person’s experience or even cause serious issues with regard to their safety and security. The simplest definition of a migrant is a person who moves from their country of origin to another in order to reside there for more than a year. Reasons for doing so may vary but are often in pursuit of better opportunities – this can include work, studies and even to move away from sites of violence and conflict. A refugee, on the other hand, is someone who has fled armed conflict, violence or persecution on the grounds of religion, ethnicity, nationality, political opinion or belonging to a particular group and has sought international protection as they are unable to access protection within their country. More often than not they can no longer remain in their country of origin due to fear of serious harm and even death. An asylum seeker is someone who claims to be a refugee but whose claim is still being determined or assessed. They initially register with the relevant authority in the country of asylum or if there is no such authority with UNHCR, who then evaluates their claim and determines whether or not they are in need of international protection. Most refugees and asylum seekers live in fear of persecution and having left behind their country of origin due to the lack of state protection available to them, they must then rely on international protection. The 1951 Convention on the Status of Refugees and its 1967 Protocol, based on the principles of non-discrimination, non-refoulement and non-penalization as well as providing minimum standards for treatment, are two of the key documents that provide for the protection of refugees. More recently in 2015, 193 states affirmed the importance of refugee protection. This resulted in what became known as the Global Compact on Refugees which was affirmed by the UN General Assembly in November 2018. The Global Compact provides a framework that recognizes that a sustainable solution to the refugee crisis cannot be implemented without international cooperation. Therefore, it provides additional guidelines for governments, international organizations and other stakeholders to equip them to both support host communities and refugees. Its key objectives are to support host communities in order to ease some of the pressure they feel, to help refuges be more self-reliant, expand and improve access to third-country resettlement whilst also supporting the conditions in the countries of origin to allow people to return safely and with dignity. Sri Lanka has yet to ratify the 1951 Convention on the Status of Refugees and its 1967 Protocol but has recognized the importance of the Global Compact on Refugees as a ‘rallying point for multilateralism and solidarity’ that could help protect and address the needs of the millions who have been displaced as a result of conflict. Despite not being party to the convention or the 1967 protocol, the Sri Lankan Government provides asylum space for refugees and asylum seekers to submit their claims to UNHCR in Sri Lanka and to remain, while a durable solution is achieved in each specific case. As per the Government’s agreement with UNHCR, they are granted space in which to reside until UNHCR processes their claims of asylum which can take between one and a half to two years. At present there 844 refugees and 826 asylum seekers awaiting the determination of their claims in Sri Lanka. Since Sri Lanka is not party to the Convention, these refugees and asylum seekers have no official legal status and are therefore unable to work during their stay in Sri Lanka. As a result, they are provided with a living allowance by UNHCR which can be used to meet their basic needs. This living allowance, however, is only available to refugees. Asylum seekers have to rely on the support of non-governmental organizations such as ZOA and Muslim Aid as well as support from family back home to meet their basic needs. The children of refugees and asylum seekers also have limited access to education. While primary education is made available to refugee children, children under the age of 5 and over 12 receive no official schooling. Similarly, asylum seekers must once again, rely on charities and individual benefactors to facilitate learning opportunities for their children. The lack of access to employment and the lack of educational opportunities, especially for secondary-school age students and youth severely impacts the self-reliance and motivation of refugees and asylum seekers in Sri Lanka. UNHCR in collaboration with Citra’s Social Innovation Lab is currently exploring opportunities to provide increased support for skills development and vocational training for refugees and asylum seekers in Sri Lanka and the 3rd edition of the Colombo Development Dialogues will provide a space at which possible solutions might be formulated. The ‘Colombo Development Dialogues’ (CDD) is a collaborative initiative by the LSE South Asia Centre (LSE-SAC) and the United Nations Development Programme in Sri Lanka, in partnership with Dilmah Tea, the Citra Social Innovation Lab and the Faculty of Graduate Studies, University of Colombo. The CDD series comprises three components: (1) A Masterclass for research students on the selected thematic area, conducted by an academic brought down by LSE-SAC; (2) The CDD forum; and (3) A post-dialogue Policy Working Paper. The third Colombo Development Dialogues on ‘Refugees, Asylum-Seekers and the 2030 Agenda’ will be held on 5 April 2019. 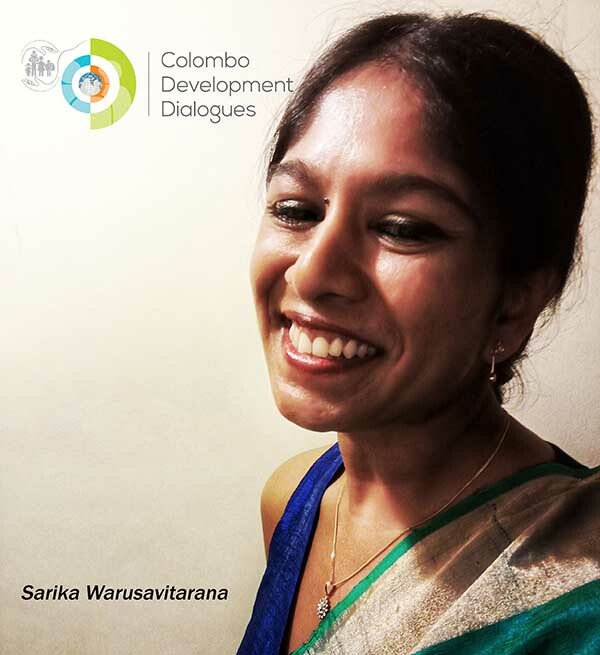 Sarika Warusavitarana currently works as a Sociologist at Citra Social Innovation Lab, a joint initiative between UNDP Sri Lanka and the Ministry of Science, Technology, Research. Sheconducts analysis of developmental issues undertaken by Citra. She brings a wealth of experience from working at the Governance Unit in UNDP Sri Lanka and continues to study the interaction between societal trends and issues on the ground.